Marshal Pitman, his jammed gun, and Ripley’s Believe It or Not. Walter W. Pitman’s good luck held for more than half a century. Not everything went his way, but in big-stake deals the figurative roulette wheel of life generally spun in his favor. Born Jan. 14, 1884 west of Muldoon in Fayette County, he helped out on his family’s farm until he married in 1904. Six years later, Pitman, his wife and two children moved to Wharton. For a time he tried to make a living selling Watkins products but returned to farming in 1912. That being a feast or famine enterprise, in 1916 he decided to run for constable in the precinct that included the county seat. Winning the election, Pitman cut a deal with the sheriff whereby he got to live for free in the jail in exchange for helping run the lockup. He also policed Wharton. “Everything went along fine,” Pitman later wrote, “until about 9 o’clock PM Sept. 15th 1917.” That was when the constable tried to arrest Francisco Lopez for being drunk in public. The boozy gunman got off two wild rounds before Pitman pulled the trigger of his single-action Colt .45. With a muzzle velocity of roughly 900 feet per second, the big bullet from Pitman’s handgun hit the cylinder of the assailant’s revolver. Half the slug entered the chamber holding what would have been the bad guy’s third shot, while the other half tore into the shooter’s hand, forcing him to drop the now-useless pistol. Pitman’s next shot caught his attacker in the shoulder, but the bullet didn’t knock him down and he ran. All this had happened in a matter of seconds within 30 yards of the jail. Hearing the shooting, Pitman’s wife Ella rushed to her husband’s rescue with a .45 in one hand and a double barreled shotgun in the other. Realizing she was right, Pitman arrested the unarmed man without further incident. Lopez recovered from his wound, paying a $200 fine and spending a year in jail for unlawfully carrying a weapon. Tried for assault with intent to murder, he got a five-year suspended sentence. After serving two terms as constable, Pitman tried his hand at carpentry for a time and clerked in a grocery store before running for Wharton city marshal. Elected, Pitman settled into what would be his job for the rest of his life. Though he later wrote that he made a pretty fair marshal, he did not enjoy immunity from crime. In 1930, someone broke into his house and stole his best suit and three pistols. But the burglar left behind the .38 with Pitman’s bullet jammed against the round that could have ended his life. A couple of years later, Pitman read that Robert Ripley’s Believe It or Not! had a national contest under way to uncover astonishing facts for use in his syndicated newspaper feature. The marshal went to his office and pecked out on his typewriter the story of his 1917 shootout and sent it to Ripley. Six weeks later, a Post reporter called the marshal to tell him that out of some 5 million entries he had won first prize in Ripley’s contest – an all-expense-paid trip for two to New York and then Cuba. 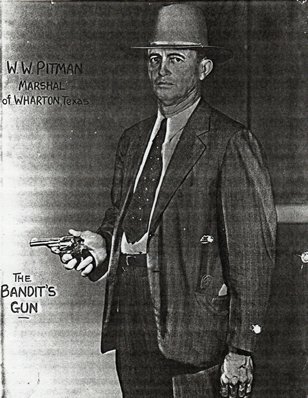 Pitman took the soon-to-be-famous pistol to the Houston Post for verification. On June 23, 1932 newspapers across the nation told the story of Pitman’s incredible shot. In the depths of the Great Depression he and his wife soon departed on a two-week vacation of a lifetime. Later that summer, fortune smiled again on Pitman when he and another Wharton County officer had a run-in with the outlaw couple Clyde Barrow and Bonnie Parker. When the two lawmen tried to stop a stolen car occupied by the pair, someone inside the vehicle opened fire as the driver did a speedy U-turn and escaped. Neither officer was hit. Three years later the marshal’s luck finally played out. On Nov. 9, 1935, the 51-year-old lawman suffered a massive heart attack. His family buried him in the Wharton cemetery two days later. The jammed pistol that arguably gave Pitman an extra 18 years of life remains in the holdings of Ripley’s Believe It or Not! Odditorium on New York’s Times Square.